The mini CORI-FLOW™ ML120 Series Coriolis Mass Flow Meters and Controllers are designed for ultra low flow ranges. The instruments provide the user with highly stable, accurate and repeatable mass flow in advanced research or production processes. ML120 offers flow ranges from 50 mg/h to 200 g/h, measured with an accuracy as high as 0.2% of reading. The compact Mass Flow Controller is equipped with a microprocessor based pc-board with signal and fieldbus conversion and an integrated digital controller for accurate mass flow control by means of the integrated piezoelectric control valve. The flow controller has a very small internal volume, making the Coriolis MFC an ideal device for fast, repetitive dosing and filling processes for reagents, additives, solvents, etc. 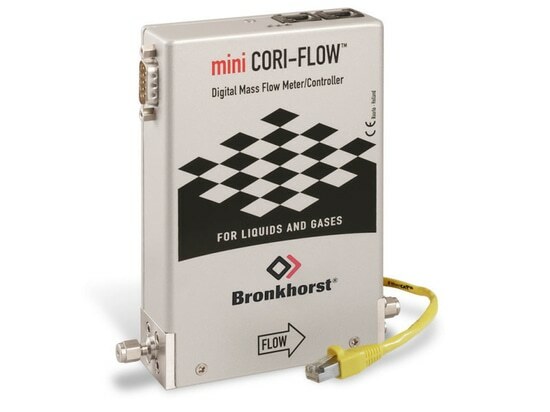 mini CORI-FLOW™ Series Coriolis Mass Flow Meters / Controllers are offered with analog and digital communication, RS232 and various fieldbus options. The ML120 extends the existing product series of Bronkhorst Coriolis flow meters / controllers, covering flow ranges up to max. 600 kg per hour.